2017 Update: Note: Someone in the comments suggested that unqualified people should not teach flute, so I'll update with a caveat; make sure you are a fully trained professional flute player with completed degrees (Conservatory-University-Performance experience) before you decide to teach flute. If you are not trained, you cannot train others. I don't teach that often in a student's home, but I do know a couple of piano teachers who do, and they actually charge more for lessons because of the cost of transportation, the extra time required to travel between homes, and, of course, there's the perceived "luxury" of the student being comfortably at home and having a "house-call". So by all means give this a try if it works in your area. Density of population plays a role, as does number of competing peripatetic teachers in the area, and there are considerations such as traffic, hours of travel and how the distances between students affects your time management. If you're using your own car, you have to make a realistic assessment of cost. 1. A promotional packet; business cards and a brochure that describes your services, and gives your contact information are the minimum. You hand out cards and brochures to all likely sources, and meet and greet at all the local music departments and schools where music is taught, and leave your material with those whom you've contacted. If you're into it, you could possibly have a small website if you want to use one for your student mail, handouts, announcements of date changes etc. Giving free "masterclasses" at local schools for their flute sections is also highly recommended as a way of spreading the word, and making face to face contact with possible students. 2. A list of all the local schools, music schools, music stores and music teachers to whom to distribute your information about yourself as a private teacher. Each month, contact several more of these sources, and keep getting your promotional material out there. 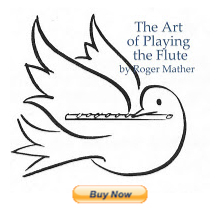 Flute books to read and advanced practice materials. General repertoire and exercise books that are recommended. 4. For basic ideas on how to teach private flute lessons (flute specific information) see my articles on teaching. 6. Finally, of course, you'll need at least one to three students to start. Often the first few students can be found through your own private flute teacher, who will also coach you on teaching techniques as you break yourself into the business. Remember too that if you aren't using other flute teachers or music teachers as a conduit to finding students, that it can take up to three to five years to develop a studio just by word of mouth through parents. So use all your musical contacts to get the word out about your lessons. How do you set yourself up as a music instrument teacher? "Business Skills for Musicians" at her site. give me the lessons to prepare for this (paid for of course!) and help me touch up on the theory if it's necessary that I take upper levels in theory. You may find that there are several music schools in Belfast that have teachers you can meet and/or have a lesson with to decide which teacher is best for you. To find a teacher have a read of this article. There's lots of online articles to help you get back up to speed on my site. And an alphabetical index of all my flute articles is here. Obviously you need to be fully trained in all aspects of flute and theory before you teach others. But you can also do your theory alongside of your teaching experience, and certainly you'll have some time at first to do additional studies, as it takes a year or two to finally get enough private students to fill your schedule. Get the new flute teacher first, though, and work from there. You need your own flute teacher to teach you how to teach. Anonymous wrote a comment, and so I'm posting it for them here. Why on earth would you actually post HOW to add even more teachers to the mix in the town you live in, when it is already full of fluteteachers? This is like a dentist putting up online HOW to do your own fillings and then wondering why theydidn't get many paying customers later on down the road. Are you wanting to end up with fewer students yourself? Because that will be the RESULT.I know you are hungry for fame after the demise of your own performing career but PLEASE think things through....you are actually NOT helping your local music teaching world by putting out TOO much information out there about HOW to become a flute teacher. already too many under employed and well qualified teachers in the area with out your encouraging more to be added to the ever-decreasing pieces of a limited pie. Sincerely, Other teachers who find what you are doing is undermining the local scene. Using this argument, public libraries would also be on the chopping block, eh? You shouldn't let people read expert information, because it's taking money away from experts. hahahahhahaha! Too funny.